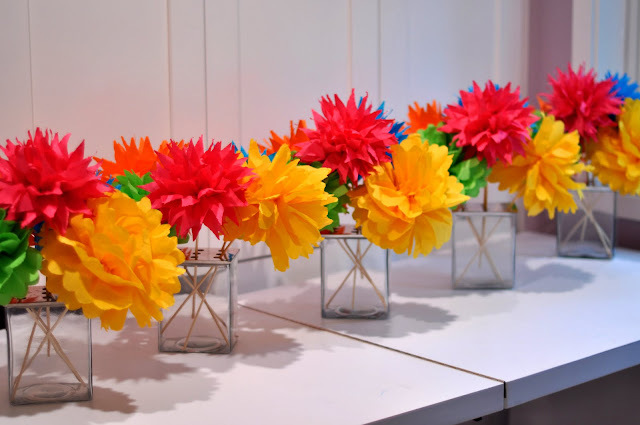 Aesthetic Nest has easy instructions on making these pretty paper bouquets out of cocktail napkins, twist ties and bamboo skewers. You can also use crepe paper and place the paper flowers in inexpensive green glass vases. We picked up a dozen easily at Goodwill. Oprah.com has a fantastic recipe for an unexpected Mexican dish: Roasted Sweet Potato and Black Bean Tacos. Not only are is it delicious, it's a perfect way to host vegetarians and it makes a great side dish. You must try it! Oilcloth tablecloths are a great way to add color to your table and create a beautiful Mexican look. This one is from MexicanSugarSkull.com and is bright and festive. You can also find them on ebay by the very friendly Cali-Gal Stitches who sells by the foot or roll to custom fit your tables. What's your favorite recipe for Cinco de Mayo? Find other ideas by following our Cinco de Mayo board on Pinterest! Follow Sassafras Paper's board cinco de mayo / mexican fiesta! on Pinterest.